The Capital Go Club in metro Washington is “looking for partners in operation and strategic planning,” reports club organizer Edward Zhang. 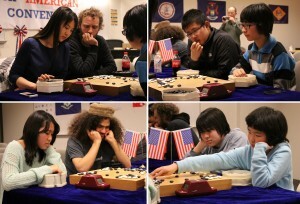 The club has been serving area go players since 2010, organizing nearly a dozen events with professional go players, team competitions among American, Taiwanese, Chinese and Korean players, friendly matches between AGA members and students at local schools, and the 2013 NA Go Convention (photo), which featured tournaments covering two weekends in New Jersey and Virginia, instruction by professional players and more. The club’s top priorities over the next year include “setting up official go program in local schools, facilitating visits by players from Asia and planning for the 2014 edition of the NA Go Convention,” says Zhang. “If you want to be part of these exciting projects, please let us know!” Volunteers don’t need to live in the Washington DC metro area, Zhang adds. “We currently have a small but energetic and talented team, and there will be multiple types of rewards for a job well done.” Reach Zhang at zhiyuanz@gmail.com. Liu Xiaohan 7D (right) won the Bei Dou Xing Cup, the second leg of the recent North American Go Convention, held February 16-17 in Arlington, VA. Zhang Shujian 5D won the Expert division, Feng Wei 6K the Proficient division, Frederick Bao 13K the Intermediate, and Sarah Crites 20K (below left) the Novice. 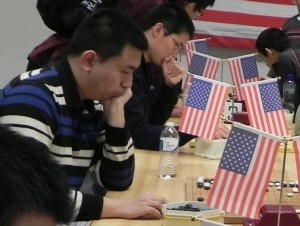 Zhou Xinyu and Zheng Xiangnan won the Pair Go championship in DC despite handicap disadvantage. Notably, in the Pair Go semi-final, Yukino Takehara teamed up with Benjamin Coplon and bested her big brother Keiju Takahara and partner Ziyi Ge. The Ge/Takahara and Rongrong Zhang/Nathan Epstein pairs took 3rd place. In the NY/NJ NAGC Pair Go, Amy Wang 2D and Justin Ching 3D from the Feng Yun Go School won the final match against Yinyu Zhou and Wuhao Jiao; Ziyi Ge /Xinzeng Feng and Yingzhi Qian/Michael Zhaonian Chen tied for 3rd. Ge was extremely excited to play Pair Go, saying “It is so much fun, and you can feel the sweetest moment when your partner plays at the exact spot you want it.” Wuhao Jiao/Xinyu Zhou and Yingzhi Qian/ Michael Zhaonian Chen took 3rd places. Ruxu Cao 7D showed his mastery of Blitz Go, topping the competition in both NAGC chapters. 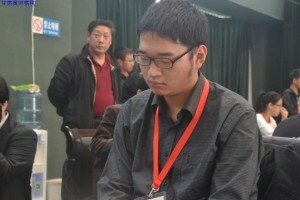 With his star performance and solid support from other teammates, Team Beijing, consisting of just nine visiting players from mainland China, took the NAGC Team champion title. 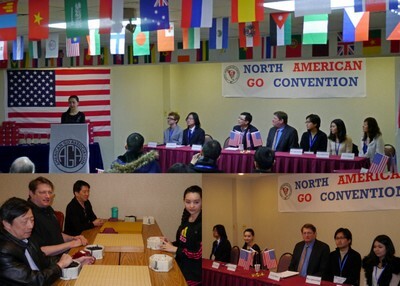 Yuan Zhou directed the DC event; Zhiyuan ‘Edward’ Zhang was “Commissioner and Chief Judge” of the NAGC. 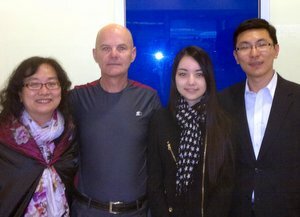 CORRECTION: The following correction was posted on 3/26/2013: In the NY/NJ NAGC Pair Go, Amy Wang 2D and Justin Ching 3D from the Feng Yun Go School won the final match against Yinyu Zhou and Wuhao Jiao; Ziyi Ge /Xinzeng Feng and Yingzhi Qian/Michael Zhaonian Chen tied for 3rd. Also: Click here for Joanne Missingham’s Interview on VOA during NA Go Convention and N.A.G.C photos & updates. Results from the NAGC Days Inn Cup New York Metro Open: Open Division (6d and above): 1st: Ruxu Cao 7d; 2nd: Ruinan Wang 7d and Zeyu Xu 7d (tie). Expert Division (3d-5d): 1st: Zhihong Ma 4d; 2nd: Justin Ching 3d; 3rd: Willis Huang 3d. Proficient Division (1k-2d): 1st: Xinyu Zhou 1d; 2nd: David Glekel 2d; 3rd: Yunxiu Zhang 1k. Intermediate Division (12k-2k): 1st: Dan Ambrose 4k; 2nd: Barbara Huang 7k; 3rd: Bab Crites 12k. Novice Division (13k and below): 1st: Sarah Crites 28k; 2nd: Eric Weiss 17k; 3rd: James-Lee Meredith 18k. There were 33 players in the Dan and 1k Division, 16 players in the Kyu Division, for a total of 49 players. There were 17 players in the Blitz Go tournament, and eight in the Pair Go tournament. Click here for the Dan Division Cross Tab and the Kyu Division Cross Tab. 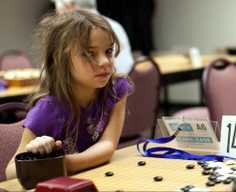 The North American Go Convention continues on Sunday, February 10. Cut-off time is 8:45A for the first round. “Drive safe” urges organizer Edward Zhang. Highlights include 3-4 rated games in the Open, awards for day-trippers 4-win trophies and 3-Win certificate), the Blitz Go Final, Pair Go Final and the Award Ceremony. Four pros are on hand: Myungwan Kim 9P, Joanne Missingham 6P, Andy Liu 1P and Stephanie Yin 1P. Click here for photos from Day One or here for more photos on Facebook. Plans for this weekend’s North American Go Convention are proceeding as a winter storm bears down on the region. “Our three professionals have arrived on-site and we’ve arranged for shuttle service from both Newark Penn Station and the Park & Ride in Parsippany-Troy Hills,” says NAGC Commissioner Edward Zhang (at right with Joanne Missingham and her parents, Nan-Ping and Errol). Click here for a short video overview about the NAGC. 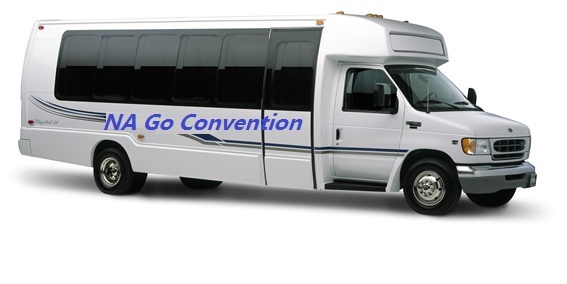 Shuttle sign-up is strongly encouraged so the NAGC volunteers can plan accordingly and reduce wait time. Players may also stay at the Days Inn Hotel on Friday if they wish to avoid traveling on Saturday, when the storm is forecast to hit. 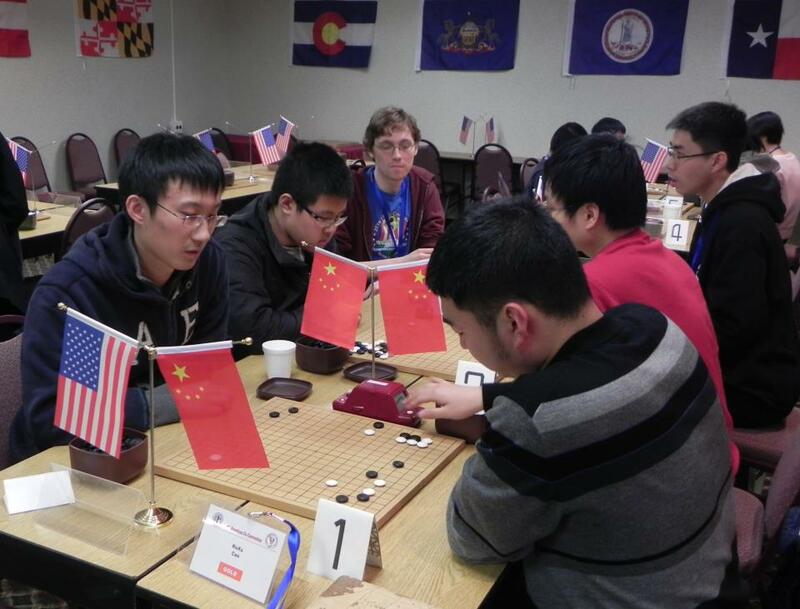 “Keep in mind that there is a second chapter of the NAGC in DC from February 13-17, with same three Open, Blitz and Pair Go tournaments,” adds Convention Director Yue Zhang 7D. Registration for the upcoming N.A. Go Convention is nearing 100, reports organizer Edward Zhang. The week-long event February 8-17 spans two weekends, beginning in Parsippany-Troy Hills, NJ (2/8-12) and then moving to Arlington, VA (2/13-17); click here for the full schedule. Organizers are welcoming daytrippers by rewarding 3-win and 4-win players, and Zhang says that with $3,170 in cash prizes, plus trophies, books, convention certificates, and rank certificates, “everyone will win something!” Those “who can only make it one day, Saturday or Sunday, may see our event as a traditional one-day-four-round tournament, with a possibility of fifth and sixth rounds in Blitz or Pair Go at your discretion” adds Zhang. The pre-registration deadline for reduced rates has been extended to January 20. “Special thanks to Zhimin Zhang, president of Bei Dou Xing restaurant franchise in Hebei, China, for donating part of the cash prize pool,” Zhang adds. Transportation is being arranged for players traveling from New York to Parsippany; sign up here and “If there are enough requests, we will schedule a shuttle bus to pick up and drop off,” says Zhang.